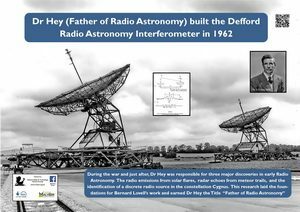 Dr Hey – father of Radio Astronomy. During the war Dr Hey was responsible for the operational use of AA radar, the attempts to overcome enemy jamming, and the deployment of radar in new roles, such as the tracking of V1 and V2 weapons, providing challenging scope for scientific initiative and research. The pursuit of this work led unexpectedly to radio-astronomical discoveries, namely the radio emission associated with solar flares the observation of radar echoes from ionized meteor trails, and the discovery of a discrete radio source in the constellation Cygnus. In 1952 Hey decided to return to research and moved to Malvern, where he had been invited to form a special research group at the Air Defence Research and Development Establishment (ADRDE). Soon afterwards the ADRDE was merged with the Telecommunications Research Establishment (TRE) to form the Royal Radar Establishment (RRE) and Hey’s team became part of the physics group. His aim was to devise sensitive and versatile instruments that could be used to investigate the positional accuracy attainable by radio methods, and to discern the ultimate limitations to performance arising from radio interference and radio reflections from the upper atmosphere, and the factors affecting radio propagation. Hey’s first radio telescope was a parabolic reflector 15 m in diameter on a German Giant Wurzburg mount. The surface accuracy allowed operation at wavelengths down to 10 cm. When fitted with a radar transmitter this reflector made accurate observations of the first Russian Sputnik satellite in 1957 and was later used to make radar observations of the Moon using a high power transmitter at Malvern with the pulses bounced of the moon received by the University of Texas, providing information on the lunar surface. It was also used to study the spectral lines of deuterium. 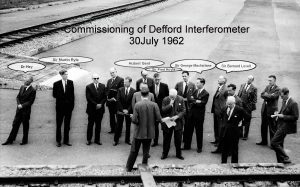 Dr Hey managed to persuaded the Ministry of Supply to fund the construction of two 25 m reflectors on mobile mounts on railway lines located on what had been the main runway at Defford provided a variable spacing interferometer on baselines of up to 1 km. The railway lines were oriented approximately East/West and North/South, so by carrying out observations with these two different baselines it allowed the aerials to map the position of the radio source in right ascension and declination providing an accurate position. They were constructed by Dutch engineers and became operational in 1961-62. The reason given for the funding was that it would be used in research in detecting and locating radar reflections from the ionised vapour trails made by incoming ballistic missiles. Of course the real reason was that he wanted to pursue his work in radio astronomy by the passive accurate location of astronomical radio sources. At this early stage in Radio Astronomy radio sources were just being found and it was essential to try and identify these with optical star maps. Radio source positions were obtained to an accuracy of about 1 arc sec, a major achievement at the time and this allowed identification with the optical star. Measurement were also carried out on the properties of Jupiter’s radiation belt measuring the polarisation using the interferometer and investigating the decametric radio emissions during Jovian storms using a purpose built half wave dipoles mounted on wooden posts attached to the Defford runway on the corners of a right angled triangle with sides 1.52,1.27 and 0.85 km. A hitherto unknown sub-millisecond component was detected. After a request from Lovell in 1964, one of the Defford reflectors was used in conjunction with the 250 ft. radio telescope at Jodrell Bank and this initiated a highly successful joint project providing interferometry observations on a baseline of 127 km and some radio sources were found to have angular sizes as small as 0.1 arc sec. 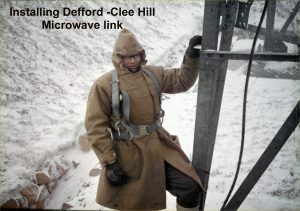 A three-hop VHF link was used to connect the antennas (the first hop being from Defford to Clee Hill. The dishes were mounted up a 150ft tower and fed by a mixture of flexible and solid waveguide. The actual work took considerable time due to the sometimes appalling weather conditions). This collaboration continued with members of the Malvern team being seconded to Jodrell Bank and Jodrell PhD students taking over the Defford telescopes as part of their thesis work. The results were important in early studies of quasars and has continued to the present day in that the only remaining 25 m reflectors is now one element of the MERLIN array operated by Jodrell Bank. Dr Hey writing in the 1960’s, summarised the achievements to date and prophesied that radio astronomy would contribute to the search to identify the composition of galaxies and evolution of the universe. This has all come true and many of the advances made in astronomy in recent years have relied on measurement in the radio spectrum.